Diagram from above of a rip current: breakers are crossing a sand bar off the shore. the pushed-up water can most easily travel back out to sea through a gap in the sand bar. This creates a fast rip current. A rip current, often referred to simply as a rip, or by the misnomer rip tide, is one specific kind of water current which can be found near beaches with breaking waves. Rip currents can endanger inexperienced swimmers. A rip is a strong, localized, and narrow current of water which moves directly away from the shore, cutting through the lines of breaking waves like a river running out to sea; a rip current is strongest near the surface of the water. Rip currents can occur at any beach where there are breaking waves: on oceans, seas, and large lakes. The location of rip currents can be unpredictable: while some tend to recur always in the same place, others can appear and disappear suddenly at various locations along the beach. A rip current forms because breaking waves push water towards the land. Water that has been pushed up near the beach flows together (as feeder currents), and this water finds a place where it can flow back out to sea. The water then flows out at a right angle to the beach in a tight current called the "neck" of the rip, where the flow is most rapid. When the water in the rip current reaches outside of the lines of breaking waves, the flow loses power, and dissipates in what is known as the "head" of the rip. Sometimes tendrils of left-over current then actually curve back towards the shore. Rip currents can be hazardous to people who are in the water. Swimmers or floaters who are caught in a rip and who do not understand what is going on, and who may also not have the necessary water skills, may panic, or may exhaust themselves by trying to swim directly against the flow of water. Because of these factors, rips are the leading cause of rescues by lifeguards at beaches, and in the US rips are responsible for an average of 46 deaths from drowning each year. A rip current is not the same thing as undertow, although some people use the latter term incorrectly when they mean a rip current. Contrary to popular belief, neither rip nor undertow can pull a person vertically down and hold them under the water surface; A rip simply carries floating objects, including people, to an area outside the zone of the breaking waves. When wind and waves push water toward the shore, that water is often forced sideways by the oncoming waves. This water streams along the shoreline until it finds a suitable exit route back out to the open water, straight out, at a right angle to the beach. This return flow of water is called a rip current. Rip currents are usually quite narrow, and are located in places such as where there is a gap in a sandbar, and also under piers, and along jetties. A fairly common misconception is that rip currents are however able to pull a swimmer vertically down, under the surface of the water. This is not true, and in reality a rip current is strongest close to the surface. This strong surface flow tends to damp the effect of incoming waves, leading to the illusion of a calm part of the sea, without waves, which may possibly attract some swimmers to that area. The offshore path taken by a rip current can be demonstrated by placing colored dye at the start of a current at the shoreline. A more detailed description involves a quantity known as radiation stress. This is the force (or momentum flux) exerted on the water column by the presence of the wave. As a wave shoals and increases in wave height prior to breaking, radiation stress increases. To balance this, the mean surface (the water level with the wave averaged out) decreases—this is known as setdown. As the wave breaks and continues to reduce in height, the radiation stress decreases. To balance this force, the mean surface increases—this is known as setup. As a wave propagates over a sandbar with a gap (as shown in the lead image), the wave breaks on the bar, leading to setup. However, the part of the wave that propagates over the gap does not break, and thus setdown will continue. Thus, the mean surface over the bars is higher than that over the gap, and a strong flow issues outward through the gap. Rip currents can potentially occur wherever strong longshore variability in wave breaking exists. 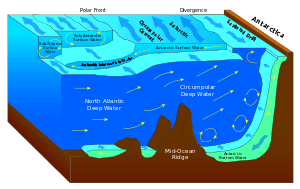 This variability may be caused by such features as sandbars (as shown in the animated diagram above), by piers and jetties, and even by crossing wave trains. Rips tend to be more common, wider and faster, whenever and wherever breaking waves are large and powerful. 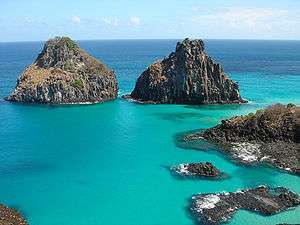 Varying underwater topography makes some beaches more likely to have rip currents; a few beaches are notorious in this respect. Although rip tide is a misnomer, in areas of significant tidal range, the rip currents may only occur at certain points of the tide. Too much water over the bar will not cause waves to break over the bar as, of course, will too little. If the shoreline shelves gently, in parts of the world with a big difference between high tide and low tide, the area between the bar and the dry sand may vary from a few feet to a mile or more over the course of an hour or two as the tide comes in or goes out. Warning sign on the trail to Hanakapiai Beach. Rip currents are a potential source of danger for people who are in shallow water with breaking waves in seas, oceans and lakes. Rip currents are the cause of 80% of the rescues carried out by beach lifeguards. Rip currents typically flow at 0.5 metres per second (1–2 feet per second), but they can be as fast as 2.5 metres per second (8 feet per second), which is faster than any human can swim. However, most rip currents are fairly narrow, and even the widest rip currents are not very wide; swimmers can easily exit the rip by swimming just a few strokes at a right angle to the flow, parallel to the beach. Swimmers who are unaware of this fact may exhaust themselves trying unsuccessfully to swim against the flow. The pull of the current also fades out completely at the head of the rip, outside the zone of the breaking waves, so there is a definite limit to how far the swimmer will be taken out to sea by the flow of a rip current. In a rip current, death by drowning occurs when a person has limited water skills and panics, or when a swimmer persists in trying to swim to shore against a strong rip current, thus eventually becoming exhausted. A study published in 2013 in Australia revealed that rips killed more people on Australian territory than bushfires, floods, cyclones and shark attacks combined. There is a noticeable break in the pattern of the waves: the water often looks flat where the rip is, in contrast to the lines of breaking waves on either side of the rip. A "river" of foam: the surface of the rip sometimes looks foamy, because the water is churned up. Different color: the rip usually differs in color from the surrounding water; it is often more opaque, cloudier, or muddier, and so, depending on the angle of the sun, the rip may show as darker or lighter than the surrounding water. It is sometimes possible to see that foam or floating debris on the surface of the rip is moving out, away from the shore. In contrast, in the surrounding areas of breaking waves, floating objects are being pushed towards the shore. These characteristics are helpful in learning to recognize and understand the nature of rip currents so that a person can recognize the presence of rips before entering the water. In the US, some beaches have signs created by NOAA and USLA, explaining what a rip current is and how to escape one. These signs are entitled, "Rip Currents; Break the Grip of the Rip". A swimmer or floater who is caught in a rip current may notice that he or she is moving away from the shore quite rapidly. It is often not possible to swim directly back to shore against a rip current, so this is not recommended. However, contrary to some popular misunderstandings, a rip is not capable of pulling a swimmer under the water; instead it simply carries the swimmer away from the shore in a narrow channel of water. The rip is like a moving treadmill, which the swimmer needs to step off of. One effective response is to remain calm and swim parallel to the shore until the swimmer exits the rip current, which is usually not very wide. Once out of the rip, swimming back to shore is fairly easy in areas where waves are breaking and where floating objects (including swimmers) are being pushed towards the shore. As an alternative, swimmers or floaters who are caught in a strong rip can instead relax and calmly float on their back or tread water. Eventually the rip current will lose its momentum, and the swimmer is then able to signal for help by raising one arm, or to swim at a leisurely pace, in a diagonal direction, away from the rip and back to shore. It is necessary for coastal swimmers to understand the danger of rip currents, to learn how to recognize them and how to deal with them, and if possible to swim in only those areas where lifeguards are on duty. Experienced and knowledgeable water users, including surfers, body boarders, and kayakers, will sometimes use rip currents as a rapid and effortless means of transportation when they wish to leave the shoreline and get out to the zone just beyond the breaking waves. 1 2 Rip Current Characteristics College of Earth, Ocean, and Environment, University of Delaware. Retrieved 16 January 2009. 1 2 "United States Lifesaving Association's - Rip Currents". www.usla.org. Retrieved 8 July 2009. 1 2 3 Rip Currents Safety US National Weather Service. Retrieved 16 January 2009. ↑ "NWS Rip Current Awareness Home Page". www.ripcurrents.noaa.gov. Retrieved 6 June 2010. ↑ Rip Current Safety Tips US Lifeguard Association. 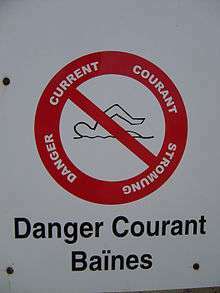 Wikimedia Commons has media related to Rip currents.